Improve your ankle strength and control for better balance in the saddle. 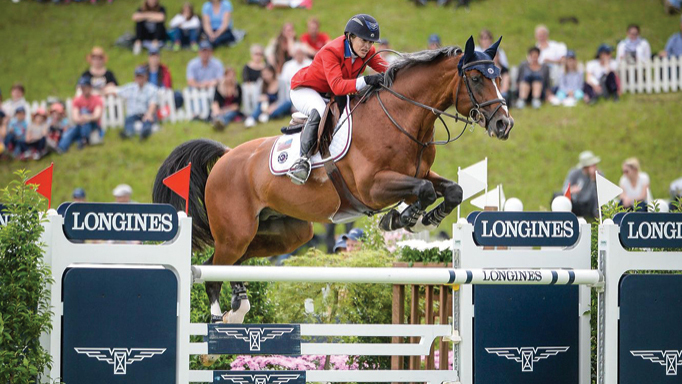 Ankle strength and stability is particularly important for riders. Unstable ankles impact the quality of your ride and make you more prone to falls. Your ankles transfer force between the stirrup and your body. This is vital for balance during quick turns or spooks, but can also have more subtle effects on weight distribution and symmetry during everyday riding. This symmetry makes your aids more precise and prevents back pain for both you and your horse. Many equestrians have sprained an ankle at least once, since we’re regularly exposed to uneven terrain and unpredictable horses. The challenge is that once you’ve had an ankle sprain you are more likely to have another. Unless properly rehabilitated, a previously sprained ankle is weaker and less stable. Fortunately, simple exercises like calf raises can retrain your brain to properly control your ankles and prevent instability and reinjury. To improve your ankle stability, you need to challenge your balance and work on ankle control as you move through your range of motion. Calf raises are a simple but effective exercise to achieve this. They are most commonly done on a flat surface, but incorporating a small step allows riders to work on ankle control in their typical “heels down” position. Start by picking a safe step for this exercise. It needs to be solid and stable, like a step or bottom stair. You should have something to grab onto, like a bannister, for increased stability if needed. Avoid step stools or any other surface that can flip when you stand on the edge. Stand on the edge of the step, with your weight through the ball of your foot – just like in your stirrups. Let your heels drop down (Photo 1), then push yourself up onto your toes (Photo 2). Repeat slowly, taking roughly six seconds to go up and down. Your goal is to control the wobble of your ankles by avoiding rolling your foot in or out. A few wobbles mean you are appropriately challenging your balance, but if you are wobbling a lot or having to step forward/backward regularly, try the exercise while holding onto something. For a more advanced exercise, try performing it while standing on just one leg. Perform these calf raises for two minutes, twice daily to improve your ankle stability and control. Once it’s easy to do the exercise hands-free, continue a few times per week to maintain your progress. Only do this exercise if you can do the motion pain free. If you’ve recently hurt your ankle you may have to wait a few weeks for this exercise to be suitable. 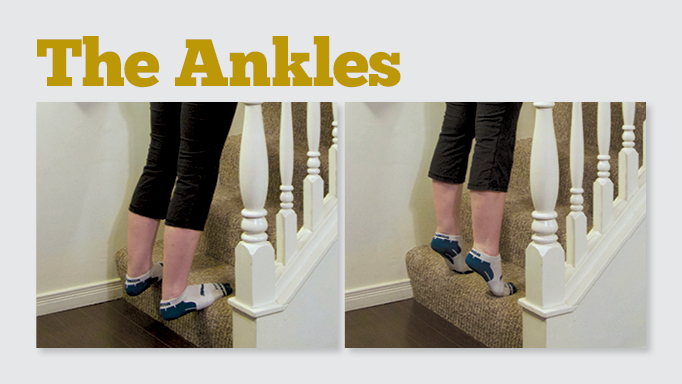 This exercise is for people with poor ankle control and people who have had sprains in the past. New injuries or pain that persists more than six weeks after the injury may require evaluation by a medical professional, like a physiotherapist. A physiotherapist can identify the root causes of instability, pain, or weakness, and work out a suitable treatment plan. Orthotics and ankle braces may be helpful for some patients, but appropriate exercises are a key component of any successful treatment plan. 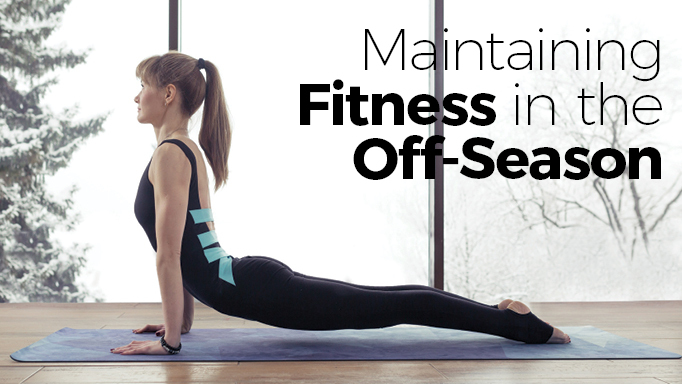 Stay fit and flexible this winter. Try this easy exercise to correct a crooked seat.